The German Fixie Inc bike builder got some attention when they won the Best Design award at Eurobike three weeks ago for their belt drive show bike. Paul Ferguson of Bionicon USA tells me they will be the exclusive distributor of these boutique fixed gear bikes in the United States. Bionicon reports quite a bit of interest as they took orders from dealers for the “Blackjack” fixed gear bike. They’ll be available in small numbers at somewhere around $2000, hopefully by the start of 2009. 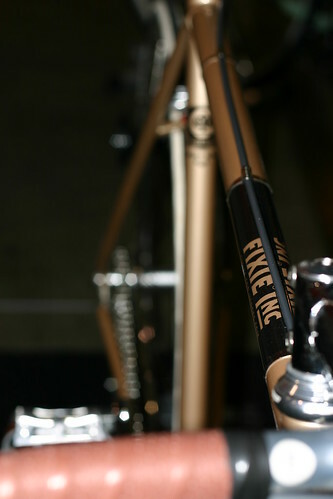 A USA dealer list should be up on the Fixie Inc website when US distribution starts. Fixie Inc bike photo by me. $2000? Seriously? I thought that this site was supposed to support and encourage bike commuting, not scare the hell out of those who are considering it. I guess that $2000 is fine if you can afford it but I guaran-damn-tee that this bike isn’t $1500 better for daily commuting than my Redline 925. Oh I’m sure it’s built far better, just not $1500 better (yes I know my 925 is Chinese). Most people (who I know) are initially interested in bike commuting to save money and in turn are already on a budget and aren’t looking to drop this much on just a bike not to mention they would still need to buy gear. Even being the experienced commuter that I am if I was in the market for a new commuter bike and did have the budget for this I’d be more likely to drop my money on a 925, Steamroller or Oneway and upgrade a few of the components I see necessary and still have money left over. While I don’t mind reading about Fixie Inc, I’d much rather see commutebybike.com focus on more realistic and practical bike commute options, especially considering the state of the economy. Hi Kaz, I agree wholeheartedly that these bikes aren’t for everybody, but there’s a lot of interest in this particular brand from a certain segment of the population. I’m working on a short post about Handsome Cycles in Minneapolis — Ben and Jesse of Handsome Cycles set out specifically to create an affordable and durable steel bike, and I think they’ve succeeded in that goal. Well, I believe in trickle-down. I don’t think a commuter bike would have received this kind of attention, or that a German manufacturer would have considered the US market for this level of bike, just a year or two ago. While I find articles on $500 commuters more realistic, I still think the higher-end stuff is interesting. Same would be true if Porsche made an all-electric 911. Could I afford it? No, but it would still be interesting, and bode well for the future of alternative-energy cars. 2k is a bit of an overkill but yet again this post is quite old so you never know how much they cost now.